This week: youth and young adults. A diocesan Youth Forum is planned which will coordinate youth activities at parish, deanery and diocesan levels. It will be headed in the deanery by Matt Williams from Walton le Dale who is a highly regarded young Re teacher at St Augustine’s. So, I’m looking for a volunteer aged between 18 and 25 who is willing to represent the parish. Any ideas? Pope Francis has asked that a World Day of Prayer for Young People be celebrated in each Diocese on the weekend of Palm Sunday. In Salford the celebration for young people will take place on Saturday 8th April at the Cathedral Centre and Cathedral starting at 1pm. The afternoon will conclude with Palm Sunday Mass at 4pm. or by scanning this QR code with your phone. 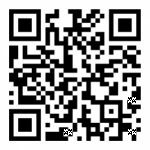 If you’re not in this age group but would like to help, please encourage the young people you know to respond to this poll by giving them the link or QR code. For further queries about the Youth Poll please email: synod2018@cbcew.org.uk.